Fr. 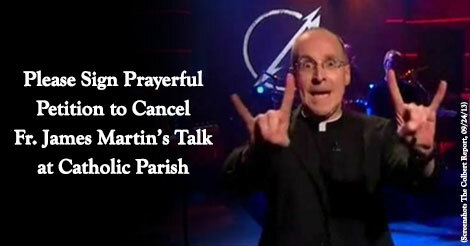 Martin gives "Devil's Horns" introducing heavy metal band Metallica? "From some crack the smoke of Satan has entered the temple of God." ... Attacked by some pastors who act more like wolves than true shepherds. For example, Fr. James Martin, SJ, who is slated to deliver a presentation at Our Lady of Lourdes Parish in Whitehouse, New Jersey on February 15, 2018. • Fr. Martin calls dissident, pro-homosexual nun a "saint"
Urge Our Lady of Lourdes-- a Catholic parish -- to find a true Catholic speaker to replace Fr. Martin on Feb. 15. In fact, Fr. Martin's push to normalize unnatural vice inside the Church, prompted Catholic leaders to cancel some of his recently scheduled appearances. The Equestrian Order of the Holy Sepulchre disinvited Fr. Martin from speaking at its gala event in New York City on Oct. 20. And the Catholic University of America also canceled an Oct. 4 appearance by the pro-homosexual priest. "Since the publication of his book, Building a Bridge, Theological College has experienced increasing negative feedback," stated a news release issued by the college. "The decision was made to withdraw the invitation extended to Father Martin." Ask Our Lady of Lourdes Parish to cancel Fr. Martin's speech on campus and find a true Catholic speaker who respects Catholic moral teaching and honors God's law. With prayerful action, you and I must oppose the "smoke of Satan" from harming more young souls. And with discernment, we must distinguish between the True Shepherd and the wolves. Yet -- despite the terrible crisis of Faith we see before us, we must always remember that Our Lord is the Good Shepherd, the One who will lead us to Heaven if we remain faithful. "The sheep hear his voice: and he calleth his own sheep by name, and leadeth them out... and the sheep follow him, because they know his voice" (John 10:4-5). "But a stranger they follow not, but fly from him, because they know not the voice of strangers" (John 10:5). After you sign your protest, please share the petition. For more detailed documentation, please click here. I prayerfully desire to cancel Fr. James Martin as speaker. Fr. Martin’s public pro-LGBT activism and open revolt against Catholic moral teaching causes scandal, especially among faithful Catholics.